The controversial Trans Pacific Partnership (TPP) was signed today in New Zealand, as opposition to the corporate-friendly deal continues to grow in the U.S. and other participating countries. The agreement now has to go to national legislatures for ratification. The TPP has been broadly criticized for expanding the legal rights of foreign corporations to challenge national and local regulations. IATP has also criticized the TPP for its potentially adverse impacts on farmers and ranchers, consumer labeling, food safety regulations and other state and local policies supporting local food and energy systems. The recent legal challenge brought by TransCanada seeking $15 billion in damages over the Obama Administration’s decision to reject the Keystone Pipeline, has raised new questions about the TPP. The suit was brought under the North American Free Trade Agreement (NAFTA), which grants corporations special rights to challenge U.S. laws and undermine climate policy. The TPP includes the same corporate rights provisions, and would allow an additional 9,000 foreign corporations to challenge U.S. laws. IATP has also raised concerns about how the TPP could reduce the food safety inspection capacity of food imports. “The TPP would open up the U.S. to a flood of seafood, dairy, fruit and vegetable imports at a time when Congress refuses to fund food safety inspection and the food industry refuses to pay for the regulatory services to expedite imports,” said IATP Senior Policy Analyst Steve Suppan. Last year, Congress barely passed the controversial Fast Track legislation which prohibits members of Congress from amending the deal. Instead, they are limited to an up or down vote on what is considered the largest so-called “free trade” deal in history. 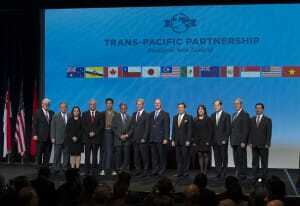 IATP has written several analyses and produced other resources outlining the implications of the TPP. More information available at: www.iatp.org/tradesecrets.